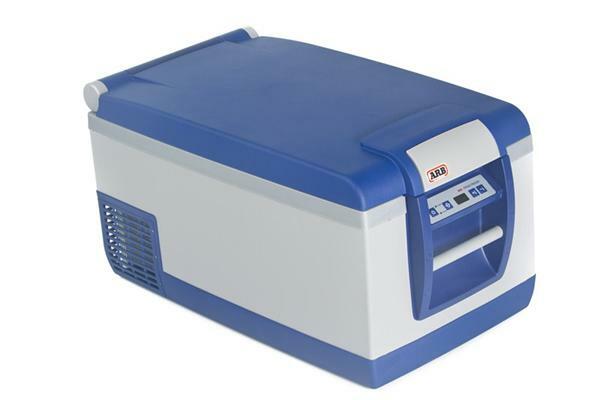 The ARB Portable Fridge Freezer (60L) is an essential purchase for family trips, camping and touring or off-roading. Ideal for remote area travel and overland excursions, this low profile design is perfect for roller drawer systems, suitable for pickups, commercial vehicles, large 4WDs, boats and camper trailers. So whether it's a weekend trip with friends or a long distance trek, a portable fridge offers the convenience of having cold food and drinks no matter where your 4Wheeling adventures take you. Specifically designed for off road use, ARB's fridge freezer models incorporate a host of features to ensure that each fridge delivers outstanding performance even in the toughest of terrains. The ARB portable fridge-freezer has been designed from the ground-up with all the features you need. All you want in a portable fridge-freezer, with a class-beating *3 year warranty. Digital control panel allows the cabinet temperature to be accurately adjusted and maintained. On-board battery monitoring with automatic low-battery cut-off. Along with the fridges we have an range of accessories to go with the ARB Fridge Freezers including the transit bag, wiring loom and the tie down system, as well as the fridge slide.